The gameplay of Tap Titans is deceptively simple. Each time the player taps, the hero swings his sword, and a base amount of damage is dealt to the enemy. Enemies begin with very little health, but will become stronger over time, just as the player becomes stronger. With each defeated enemy, players earn coins, which can be spent to upgrade the hero’s own attack, or purchase and upgrade helper fighters. These personal upgrades become more expensive over time, but the rewards provided by fallen enemies also become larger over time to compensate for the increase. Helper warriors include wizards and assassins (as examples), and can be used as passive attackers, so damage is caused to monsters even while players may not be actively tapping on the screen. It’s worth noting these passive attackers will continue to attack even when gamers have left the game, so users receive large coin bonuses when they return, based on the monsters they’ve killed in the background. Monsters are presented in groups of ten, with every tenth monster being a mini-boss character. These are the only truly hectic moments of gameplay, as players have a limited amount of time to drain their health, either with their own tapping attacks, or with their helper characters. If players fail to drain their health before running out of time, they’re stuck on the current group of monsters until they can do so. Over time, players will receive treasure chests from a helpful fairy. These may contain coins, or boosts that see helper characters attack more frequently for a short amount of time. Boosts may even see a clone of the player character attack automatically for a few seconds, so players’ fingers can take a rest. Players will unlock achievements as they defeat enemies in bulk, with these achievements rewarding users with premium currency. This, in turn, can be used to purchase coins in bulk, to summon a grim reaper that drains a monster’s HP by 50 percent, or unlock a “tap-and-hold” automatic attacking feature so players don’t have to manually tap for a period of time. 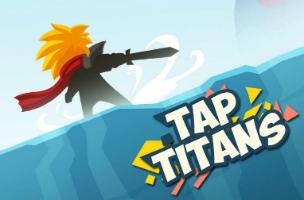 Tap Titans is available to download for free on the iTunes App Store and Google Play.